From the essentials collection, debuted in 2013 and ongoing. 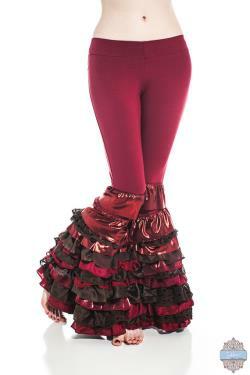 Revel in the decadent and yet eco-friendly red & brown deluxe ruffle pant. These are so much fun. With this gorgeous pant, you can choose how much of the ruffles you wish to show. Meaning, any length skirt or hip scarf will wear well over the deluxe ruffle pant, or pair with a simple belt to show off those hard working gams. Picture, also: layered tunic-style tops or a blouse and vest for a boho look, or go totally tribal with a 25 yd skirt. The deluxe ruffle pant is perfectly contoured to fit and contain your curves, with a dipped front waistband and a slightly higher back. A sandwich-style contoured waistband lends strong elastic support without the fibers being directly against your skin. The ruffle sections themselves are deceptively lighter than they look. These fit true to size, but if you find yourself between sizes, we recommend choosing the next size down. The organic cotton & bamboo fabric is very flexible and after warming up to your body, it will relax. Length: choose the inseam you would normally wear for a full-length pant. If you find yourself with an odd-numbered length, round up. If you're going to wear these with shoes, measure your inseam while wearing the shoes. 2xs fits upper hip 30"-32". Pants: luscious, strong organic cotton/bamboodex. Ruffles: variousdex, lace, vintage bits, silk, and lots of other pretty fibers. Slim fit with wide flared leg. Of imported and recycled fabrics. No two ruffles are exactly alike. Pants fabric is naturally pill-resistant and anti-microbial; wicks away moisture. Care: hand wash with cold water. Hang or lay flat to dry. 2014 addie mannan/sakkara clothing & costume llc.